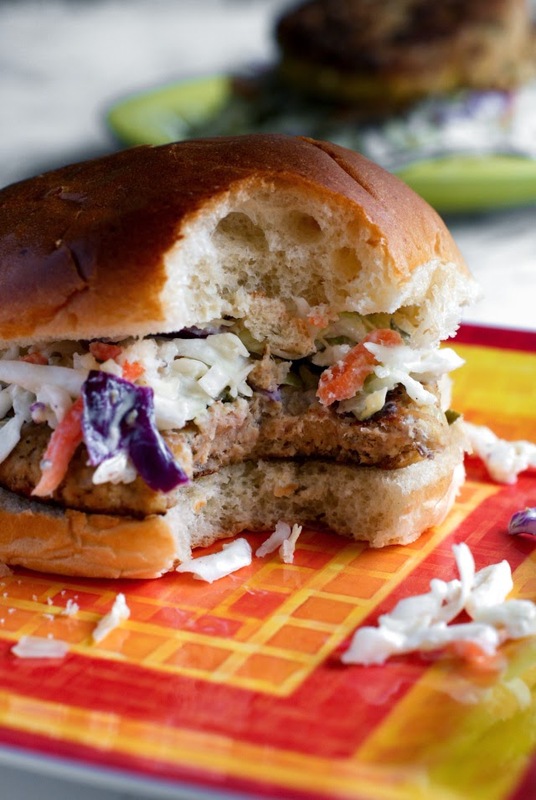 This Tuna Cake recipe transforms canned tuna into gorgeous golden tuna patties that are served alongside a lightened-up tartar sauce inspired cole slaw. Pile it all on a bun to make a tasty tuna burger! Do you like tuna? I like tuna. It was the first fish I ever really liked as a kid thanks to tuna sandwiches. And then as an adult, tuna was the first fresh fish filet that I really enjoyed. Mmmmm...I fell in love with blackened tuna ceasar salads when I worked at a little beachside cafe after collge. So yeah, I'm a tuna fan! This recipe starts with the beloved tuna. But what's better than just plain old tuna? I'll tell you what's better than plain old tuna. Tuna that's formed into patties and then fried up in some butter and oil. That, dear friends, takes tuna to a whole new level of awesomeness. Once you have the tuna patties, you need something to serve them with. Tartar and fish go hand in hand, so I decided to make a homemade tartar to go with them! This is no ordinary tartar though. This tarter is a no mayo tartar. Instead of mayo, which I really don't care for all that much, I used my old substitute favorite...greek yogurt! 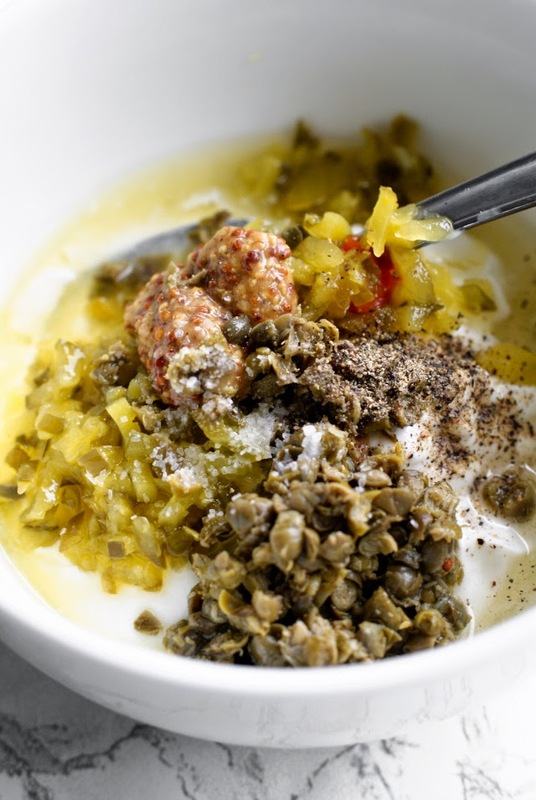 Add a little relish, some salty capers, a dollop of good mustard, a little zip from a splash of white wine vinegar, and bam! Homemade healthy tartar! Tuna cakes on their own are a tad on the mushy side even when they're fried up, so for texture I brought some shredded cabbage to the tuna cake party. I mixed that tasty tartar up with that crisp coleslaw mix and made some tartar slaw! It was the perfect textural contrast for the tuna cakes and the flavors went really well! I had planned on just serving these on a plate with the slaw on the side, but then I got the bright idea for a tuna cake BURGER topped with the slaw. So good! Rather brilliant, if I do say so myself. If you've been looking for a way to use up your cans of tuna, or if you're looking for a healthier alternative to something served on a bun, give these tuna cakes a go. 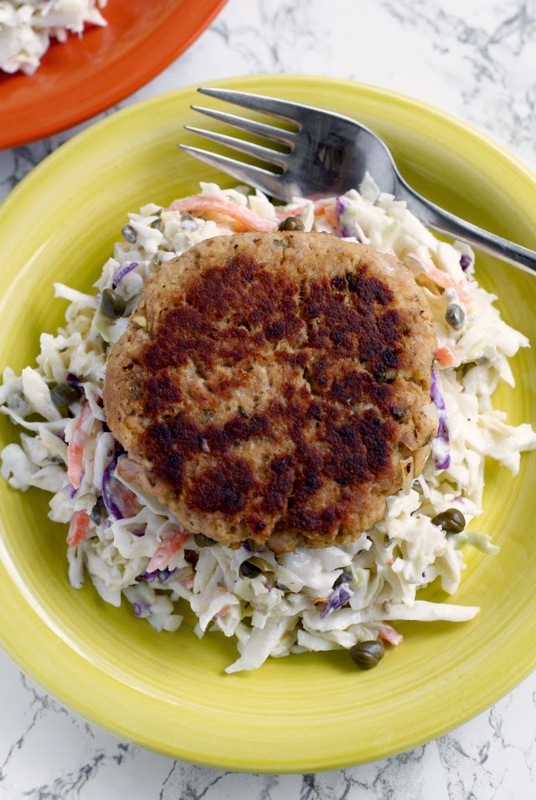 The crisp tartar slaw is the perfect pair for these golden pan-fried tuna cakes! Drain the tuna and put it into a medium bowl. 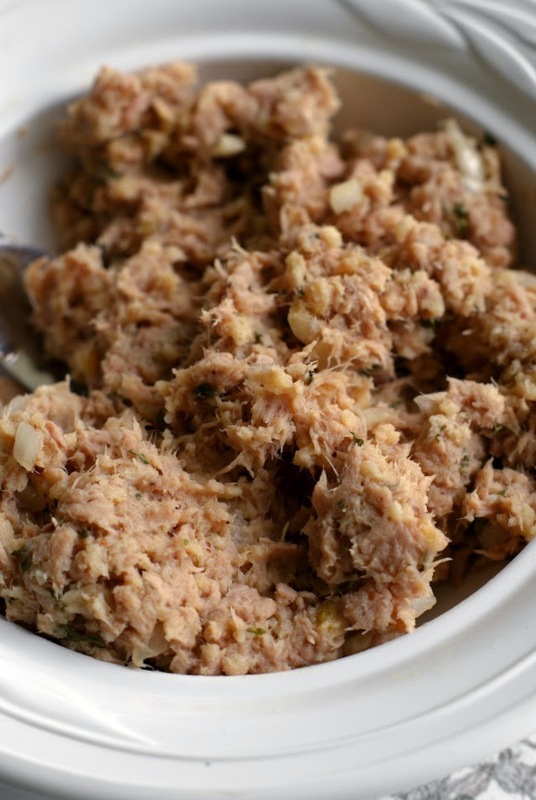 Add the breadcrumbs, lemon juice, onion, mustard, parsley, hot sauce, salt, pepper, and egg to the tuna. Mix well to combine. Shape into 4 balls and flatten into patties. Place them in the refrigerator to chill. In a large bowl, combine all of the ingredients for the slaw. Add the cole slaw mix to the bowl and stir until all of the slaw mix is coated in the tartar sauce. Season with salt and pepper, to taste. Heat a cast iron skillet over medium-high heat. Add the olive oil and butter to the pan. When the butter has melted, add the tuna cakes to the pan. Cook for 3-4 minutes per side. 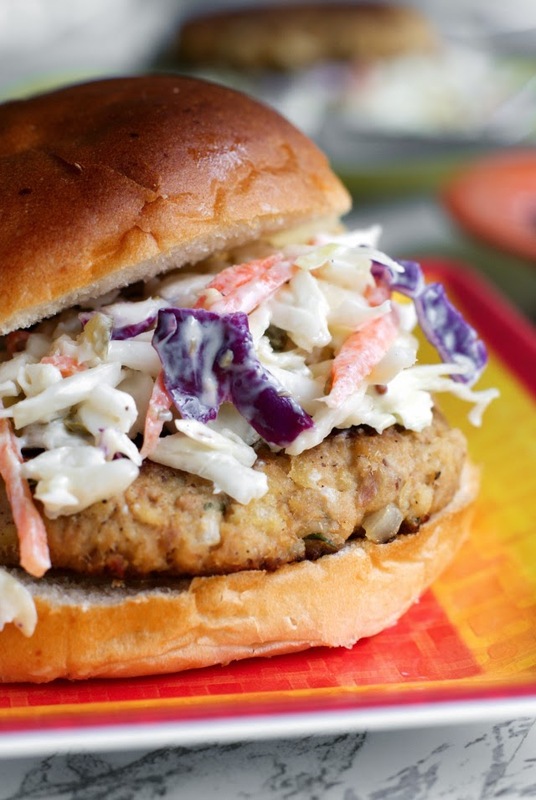 Remove from the pan and serve immediately with the slaw on the side or on a burger bun with the slaw as a topping. Source: Tuna Cakes adapted from Simply Recipes and Tartar Slaw inspired by Ina Garten. Yield 4 small tuna patties or 2 large tuna patties. Store any leftover slaw in the fridge for up to 3 days. I love tuna patties! I haven't had them for awhile, but they were a staple when my husband and I were first married! Tuna was and still is pretty inexpensive. And it is pure protein! something else for the slaw is a dish that I had a popular restaurant it was wonton tacos! they used chicken and a cabbage slaw, you may enjoy making that with the slaw as well! thanks for the recipes!